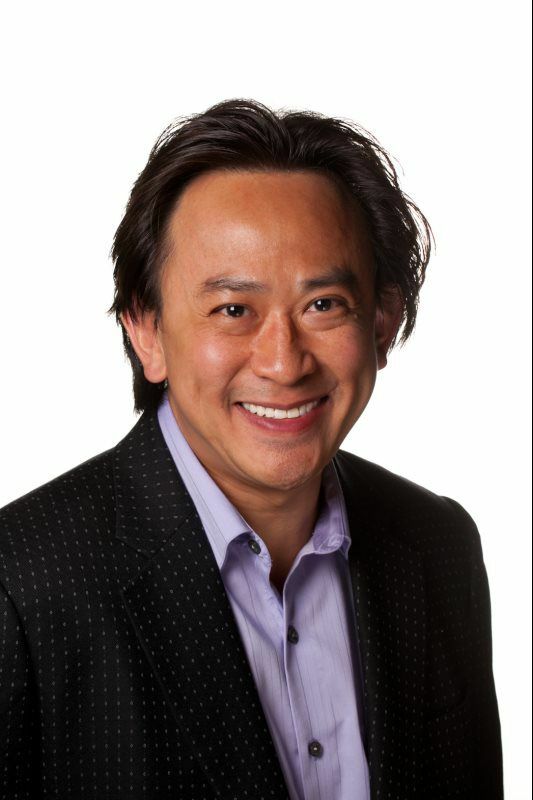 Dr. Doan was born in Saigon, Vietnam and came to Florida when he was only one year old. Raised in Sanford, Florida, he graduated from Vanderbilt University with a Bachelor of Arts in Biology and a minor in Fine Arts. 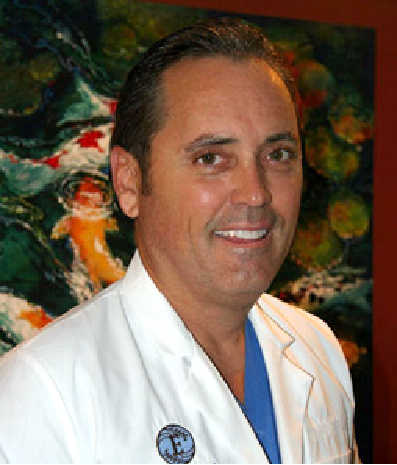 He received his Doctorate in Dental Medicine from the University of Florida College of Dentistry in 1999. Following this, he completed a general practice residency at New York Hospital with an emphasis on management of medically compromised patients and aesthetic and reconstructive dentistry. During his residency program, Dr. Doan was awarded Resident of the Year and the first ever Dr. Lawrence Diamond Award for excellence in all aspects of treating gum disease. He found himself and his wife, Linda, planting roots in the Sarasota area and purchasing the practice of Dr. Thomas W. Cail in August 2002, renaming it to Exceptional Dentistry of Sarasota.Dr. Doan consistently strives for excellence in all aspects of reconstructive and aesthetic dentistry. He is a graduate of the Dawson Center for Advanced Dental Studies. A sustaining member of the American Academy of Cosmetic Dentistry, the Florida Academy of Cosmetic Dentistry, the Academy of General Dentistry, the American Dental Association, the Florida Dental Association, the West Coast Dental Association, the Sarasota County Dental Association, the Sarasota Study Club, the Spear Study Club, SaraGators Dental Study Club, and CEREC Study Club. Currently, Dr. Doan is working on is accreditation with the American Academy of Cosmetic Dentistry and is a Board Member of the Florida Academy of Cosmetic Dentistry. Dr. Doan regularly attends hundreds of hours of continuing education courses each year across America to expand his professional horizons and to keep up to date on the very latest techniques.Alongside his academic achievements, he and his wife Linda have established, organized and now lead a dedicated team of local dentists and their staffs in an annual charity designed to give back to the under served community. Project Christmas Smile provides a day of free dentistry during the Christmas holidays with the hope that no one has to wake up Christmas morning with a toothache. In conjunction with the American Academy of Cosmetic Dentistry, he is also a participant in the Give Back a Smile Program where we offer free oral rehabilitation to victims of domestic violence. During the 2006 meeting of the American Academy of Cosmetic Dentistry meeting in San Diego, he was honored with the Partners for Peace Award for his charitable contributions. Gulf Coast Magazine recognized him as one of the top forty Sarasota business persons under age forty (40 Under 40) in 2005.Beyond all of his achievements, his interests are in martial arts (Kendo and Karate), arts, photography, music, cooking, reading, tennis, travel, automobiles, and philanthropy. Dr. Doan is, above all, a family man who enjoys time with his wife Linda, his three daughters Mischa , Esme, and Elan. Dr. Suarez is a native born and raised Floridian from Miami. 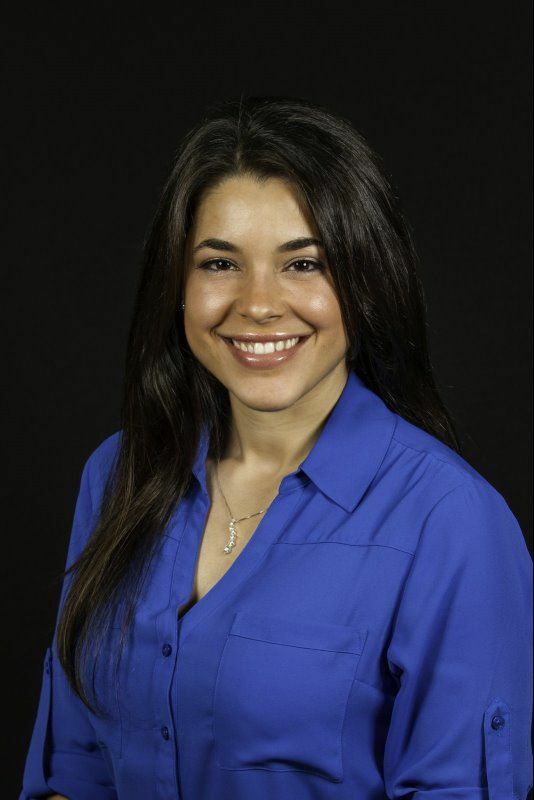 Receiving a Bachelor of Science in Biology and a minor in Chemistry at Florida International University in Miami, she pursued a career in dentistry from the prestigious Temple University School of Dentistry in Philadelphia. Here, she graduated top in her class and rather than going straight to private practice, she decided to further refine her skills by accepting a position to the General Practice Residency program at Christian Care Health Network. From several hundreds of applicants she was selected to be part of only seven residents that met their strictest of requirements. As a resident, she covered all aspects of dentistry from routine dental care to trauma for two hospitals, one in Wilmington and the other in Newark, DE. Her focus has been and is still today on Aesthetic Dentistry encompassing Advanced Comprehensive Restorative Dentistry, Dental Surgery , Prosthodontics, Implant Restorations and Dentures. She is well versed in all phases of dental care, works closely with specialists and is an advocate for her patients. Her passion is for Education and Empowerment. She gives you the tools you need to reach your goals. Her talents unfold in Surgery and Prosthodontics. Dentures are not a thing of the past and sometimes teeth do need to be removed. This is are a reality for many. As if dealing with tooth loss isn't overwhelming enough, wearing a prosthesis can be challenging. You don't need the embarrassment of a poor fit or poor aesthetics (i.e. a smile that just doesn't belong to you). She believes in a team approach, open communication and a well designed plan. She is here to discuss your options and guide you through the process. She continues to further her education by attending Dr. Kois' Center for advanced graduate level training for practicing dentists. The Kois Center is an evidence based teaching center with the latest advances in esthetics, implants and restorative dentistry. Being a top dental clinician, she has a unique understanding of comprehensive health. She doesn't just focus on the teeth, she always takes a holistic approach to treatment planning dental cases with her patients. Integrating overall health and dental health, she has provided her patients not only beautiful smiles but also tools of healthy habits for long lasting success. Treatment is not about her, it's about you! What fits your needs? What fits your lifestyle? What are your goals and how do we get there? Her practice has gravitated towards helping patients overcome their anxiety and fear of the dentist, especially those with a history of unfavorable dental experiences. She understands the REALNESS of dental anxiety and with her team she manages to make visits fun and pain free. Dr. Suarez is Board Certified in Florida and holds memberships to Academy of General Dentistry, American Dental Association, Florida West Coast District Dental Association and Sarasota County Dental Association. She is also a member of the Frank Spear’s Study Club. Spear Study Clubs focus on actual patient cases and treatments with expert clinicians presenting the latest techniques. From Cuban decent, she is fluent in Spanish and Latin culture. She is married to the love of her life, Mr. Glenn Watkins Jr. and has a little toy poodle that runs their lives. Rich in Cuban culture, she is all about family and great food. She enjoys spending time with her family, especially her nieces and nephews. If she’s not fishing or boating, you may find her participating in fierce athletic events. 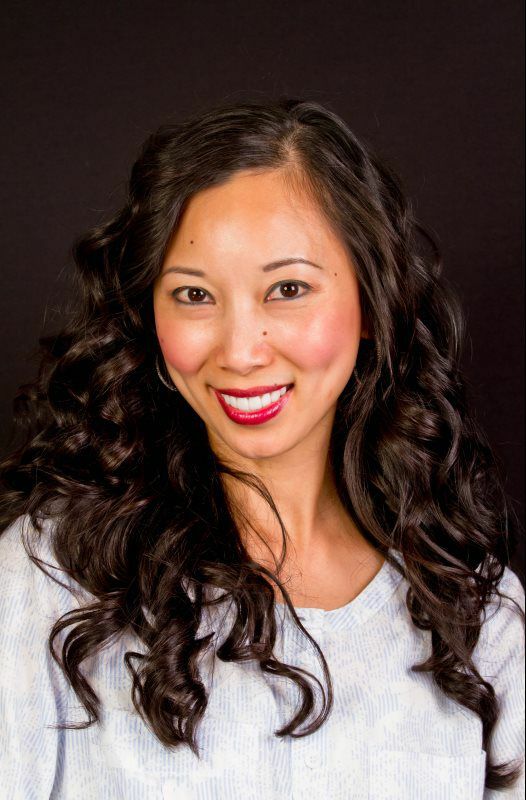 From her origins from Saigon, Vietnam to her hometown of Gainesville, Florida, Linda began calling Sarasota her new home when she moved here in 2002 with her husband, Dr. Doan. With 10 years of dental experience and more than 10 years in customer service, she now operates as the office's business administrator. She is known around the office as "TCB" or "Taking Care of Business. "Escaping from the communist regime of Vietnam with her family back in 1980 and toughing out rigors of immigration to the United States, Linda is a survivor. Learning from her parents and helping them in their successful restaurant business in Gainesville, she is always out giving a sincere helping hand. She continued her education by attaining her Bachelor’s degree in Microbiology at the University of Florida and then her Masters in Psychology from Columbia University.As an enthusiastic sponsor of charities, Linda has been involved with the Junior League of Sarasota, Boys and Girls Club of America, Sarasota Family YMCA Foster Angels Program, Sarasota Sports Foundation, Key to the Cure, United Cerebal Palsy, Cooking for Wishes, Make-A-Wish Foundation, and co-established Project Christmas Smile alongside with Dr. Doan. Giving back to your community has always been a standard that Linda follows.When time is available, Linda is an avid tennis player, a lover of books, a music connoisseur, and a pro in the culinary arts. Above all, family is the most important thing to Linda, both personal and her family at the office. Knute was born and raised in his hometown of Venice, FL in 1958. He is one of a very few Florida natives that you may meet. His love for the water has kept him here in this tropical paradise.Knute graduated as President of his dental hygiene class from St. Petersburg Junior College in 1984. For over 35 years he has enjoyed his profession and the ever changing field of Dentistry. As a veteran team member in this practice, our patients rave over Knute’s special touch, jovial demeanor, and absolute professionalism towards them. His father, two brothers, and sister are also in the dental profession and have a family dental practice in Venice, Florida. His passion outside of work is spending time with his two sons Ryan and Rees. He has a deep love for scuba diving, hunting for shark teeth, fossils, lobsters, stone crabs, and spear fishing. Anything relating to the sea is one of his greatest joys. He used to be a competitive softball star player for twenty years. On his off season, he enjoys his family at his parents summer home in Pentwater, Michigan.As he would say it, "Teeth can be boring. However, people never are." His personal connection with his patients is no less than extraordinary and you will feel the genuine care. With all the fast changing pace of modern dentistry, continuing education is a vital part of his daily routine to give his patients the utmost optimal care. 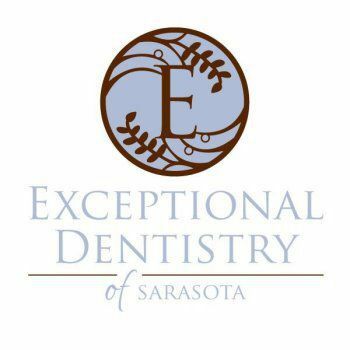 At Exceptional Dentistry of Sarasota, he has always expressed that we refuse to "cut corners" or compromise on quality or moral ethics. This is why Knute is an integral part of our dental family and your dental hygienist. 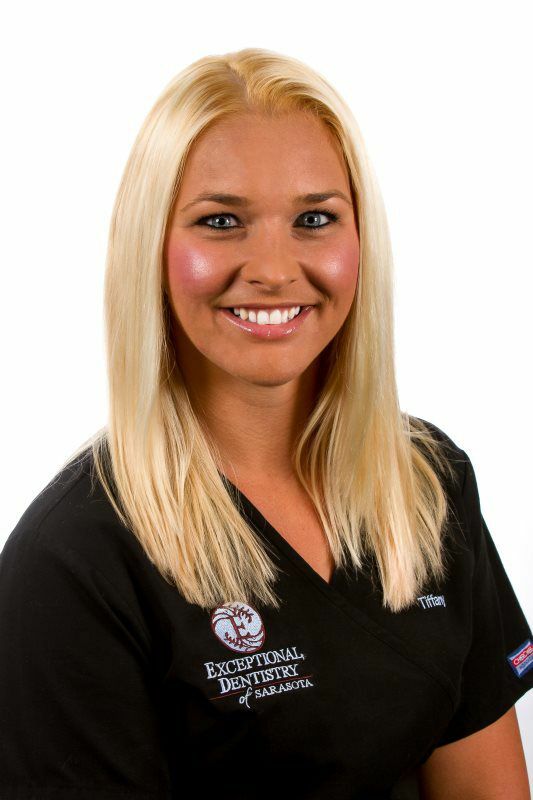 Tiffany grew up in Bradenton and completed dental assistant education at the prestigious Manatee Technical Institute in 2012 with at Certification Degree with Expanded Functions. Immediately after MTI, she began to work with Dr. Christina Suarez Watkins at Coast Dental in Sarasota. When Dr. Suarez sought the desire to do more comprehensive aesthetic dentistry for her patients at Exceptional Dentistry of Sarasota in 2014, Tiffany was requested by Dr. Suarez to be her right handed woman and has been loving it ever since. When you meet Tiffany, your stresses in coming to the dentist will be immediately relieved as she is surely a ray of sunshine in the office. Not only is she a talented dental assistant, but she always strives to build relationships with her patients. Their trust is her ultimate reward.On her down time, she loves spending quality time with her husband, Robert, and her beautiful children, John and Meadow which usually consists of boating, fishing, and other outdoor activities. Rachel was born and raised in Arkon, Ohio back in 1971. 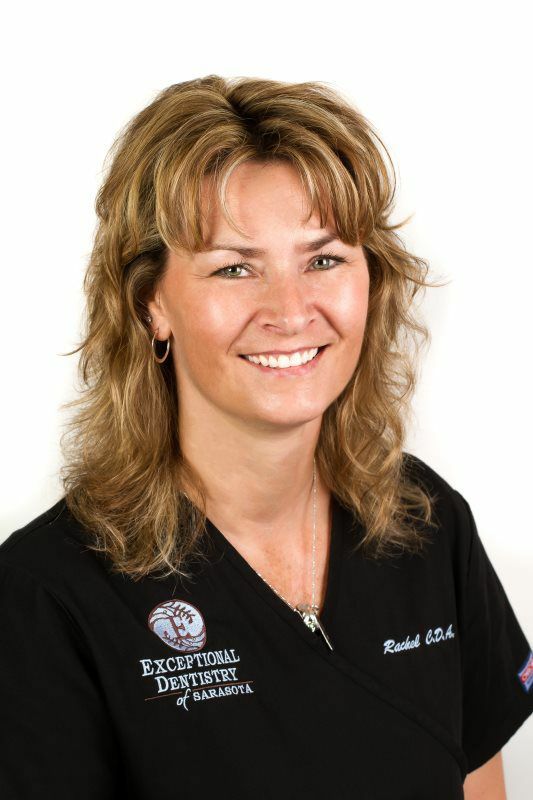 After Rachel received her certification in dental assisting with expanded duties from Akron Medical / Dental Institute in Northeastern Ohio in 1994 and having an extensive dental assisting career, she moved to Sarasota in 2005 and was lucky enough to join the team at Exceptional Dentistry of Sarasota. Since that time, she has been the most entrusted assistant and right hand woman to Dr. Doan. Dr. Doan has always commented on the exemplary care that she displays for each and every patient just as if they were her own family member. This kind of care and sincere trust is just a few things that many of our patients have experienced with her over the years. Without a doubt, caring for our patient's experience is her number one priority as she calls our office her home away from home. Be rest assured that her dedication and hardworking ethic exudes when she goes out of her way to make you feel comfortable. Working with Dr. Doan, she makes it a standard to have the highest level of continuing education to deliver the most up to date techniques. When she is not working, she's spending time with her husband, Bill and two sons, Conner and Braeden. She loves reading, walking, hiking, cooking and baking, a master chef in her own right. Most of all she enjoys spending time with her family and affecting the lives of others in the most positive way. April was born in Tennessee and moved to Vero Beach, FL at the age of 6. She graduated with the degree of Dental Hygiene from Santa Fe Community College in Gainesville, FL in 1998. After several years of practice she finally settled her roots at the Exceptional Dentistry of Sarasota in 2010. April's love of dental hygiene fuels her desire to provide an important service to our patients. She enjoys the opportunity to help our patients understand why complete oral care is so beneficial to their overall health. April has two children, Sean and Audrey. When she is not working, she is very active in volunteering at her kids' school. April also enjoys running, playing tennis, working out, reading, boating, and most of all spending time with her family and friends. Office AdministratorFrancescawas born in Bucharest, Romania and moved to beautiful Ontario, Canada at ayoung age. Living all of her life surrounded by all the seasons up north, sherecently moved her life to Sarasota, Florida in 2017 with her husband Andrew.Drawn to the ocean and endless summers, she was able to follow her passion fordentistry from Canada to the US. Traditions and family is something that standsnear and dear to her so she makes it her priority to provide that to everyonethat walks through our doors, whether it’s with a warm smile or a boisterouslaugh. When she’s not at work, she lovesbeing outdoors whether it’s hiking or going on adventures, working out, windingdown(or up!) with some music, trying new and exciting foods, or cuddling up onthe couch with her husband, Andrew and Nala their newly adopted cat, to watch amovie.